Before considering how to adapt to climate change, it is first necessary to understand the extent to which natural and human systems will be affected by various change scenarios. That is the purpose of a climate change vulnerability assessment (CCVA). These assessments treat climate change as a driving agent of change while acknowledging that other forces may also be at work, and they provide specific information on exposure and sensitivity as well as on the adaptive capacity of populations and the systems on which they rely. For three years, starting in 2011, the USAID African and Latin American Resilience to Climate Change (ARCC) program gave specialists an opportunity to explore and discover how best to conduct CCVAs. In many countries, these were the first such assessments to have ever been conducted. ARCC’s work brought improved science, methods, tools, and shared learning on adaptation to the programming of USAID and its partners. This Compendium draws on experience gained through preparing assessments in the Dominican Republic, Honduras, Malawi, Senegal, and Uganda. The lessons compiled in this report constitute a reference tool that can be used by assessment designers to define the scope of a CCVA and by key decision makers to introduce climate change adaptation into new or existing policies and programs. The features of CCVAs make them complex undertakings. They both inform and are informed by stakeholders—community groups, policymakers, climate scientists, and other interested or involved parties. The assessments are highly multidisciplinary, as they must address a variety of sectors, including agriculture, energy, water, health, environment, public works, and trade and investment, among others. They also must operate on many scales simultaneously, considering the adaptive capacities of individuals, the community, and local and national institutions. In addition, climate change projections have a significant degree of uncertainty. These factors present challenges to the goal of any CCVA: to present results that are accurate, comprehensive, and useful, and that integrate all lines of inquiry. Among the most important lessons from the ARCC experience was that a CCVA is both a product and a process. As a product, it compiles an evidence base for decision making; as a process, it both enables and demands meaningful dialogue with stakeholders. With this in mind, the Compendium offers lessons on conducting assessments, understanding their main analytic components, and using assessment findings to inform policy or programming. Figure from report shows a multi-level institutional assessment framework adapted for ARCC's Malawi CCVA called the "Adaptive Capacity Spheres of Influence." Governments and donor agencies increasingly rely on CCVAs to improve their understanding of the nature and degree of potential climate change impacts, the sensitivities of systems and human populations to those impacts, and the capacities of people and institutions to adapt. A CCVA treats climate change as the driving agent of change and provides information on sensitivity, exposure, and the adaptive capacity of populations, as well as the systems upon which they rely. But as we have seen, "climate change," "vulnerability assessment," and "adaptation," are all multi-faceted and, to a degree, open-ended concepts. The ARCC assessments were distinguished by their evidence- based approach to the analysis of the past, present, and projected future climate, and by their use of integrating frameworks for designing and organizing the dimensions of vulnerability (exposure, sensitivity, and adaptive capacity). 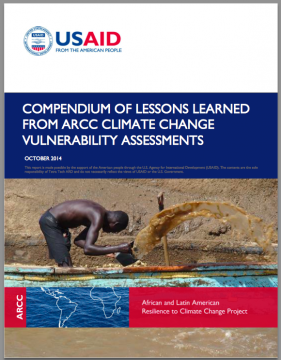 By presenting lessons learned from the ARCC experience, we hope that readers will draw insights from this Compendium that will help them define the scope of new CCVAs or integrate ("mainstream") climate change vulnerability into existing programs. We found that understanding and addressing climate change within an already complex and challenging development context is as much an art as a science. While credibility, salience, and legitimacy are hallmarks of a well-conceived and well-executed assessment, the ability to ensure that the information is used effectively to address the uncertain and multi-faceted nature of climate change requires the ability to make sense of complex relationships between climate change and natural and human systems. 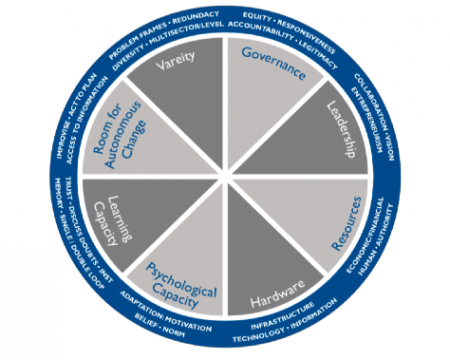 For this reason, every CCVA is unique—tailor- designed to meet the needs of a given group of decision makers and development practitioners within a particular setting. Yet, while the overall task is complex, care must be taken to create a design with a clear purpose that produces evidence-based findings that decision makers can "own," understand, and act on. The results of a CCVA can be used to inform a future investment strategy or portfolio—or an existing portfolio—by promoting proven adaptation strategies. They can serve as a source of innovative interventions that will enhance the resilience of populations or systems in the future. The results can also be used as a baseline to gauge the effectiveness of these interventions. Typically, ARCC assessments have informed future USAID climate change adaptation investment strategies in the areas of food security and natural-resource dependent livelihoods, such as agriculture, pastoralism, and fisheries. The CCVA product must be easily understood and more than the sum of its component parts. Our assessment teams sought to discover and communicate the compelling "story" behind the data and information: the organization or pattern, the unified whole. The truly salient results—the prominent, conspicuous results that really stand out and may have the greatest impact—are those that are derived from a deep understanding of the social, economic, cultural, and institutional contexts in which the CCVA is embedded. These contextual factors should—and do—influence the design and implementation of the CCVA, the way and extent to which CCVA results can be effectively communicated or disseminated, and the manner in which CCVA results are interpreted, understood, and applied. Again, by recognizing and designing the means for gaining this deeper contextual understanding, CCVA teams can further enhance the usefulness and uptake of the results. In practical terms, this was done by integrating local expertise into assessment teams, working closely with the potential users of the assessment to come to agreement on the purpose and focus of its findings, and seeking input from stakeholders—those potentially affected by climate change—at critical points in the process. Moving from results to recommendations for action, ARCC found that the most meaningful uptake may take place long after the results have been published, and that CCVAs may have many uses beyond those for which they were designed. Assessment implementers must be aware of the range of potential uses of the results of their work. CCVAs aim to present the most objective, scientifically valid information possible in order to ensure that future investment is well-targeted to real problems, greatly increasing the odds of successful interventions. However, although assessment teams strive to ground their work in evidence and scientific research, uncertainty and subjectivity inevitably enter into the process in multiple ways. Throughout the assessment process, the team needs to be aware of the limitations of an assessment and how its results may be used for specific ends in the future. The use of a CCVA as a tool to increase awareness of climate change—for encouraging people to imagine the potential impacts of climate change on their lives and livelihoods—may be more important than the assessment itself. It can provide powerful leverage for change if it is deemed credible, salient, and legitimate by the decision makers that influence change. Teams that actively seek to identify and engage local champions during the conduct of the CCVA will also help ensure its continued relevance after its completion. ARCC assessment teams engaged USAID as their initial local champion, and through a process of participatory stakeholder review of findings and generation of recommendations, gained additional champions to advocate and act to address climate change. This Compendium provides a snap-shot of, and insights from, a period in which approaches and methods for assessing climate change vulnerability are still being pioneered. It was designed to make a contribution to this growing body of knowledge. In the meantime, climate continues to change, as does our understanding of it. The CCVA cannot be a static thing. The accuracy of climate projections, particularly at sub-regional scales, is dependent upon the quality and quantity of historical climate data available; these data sources are continuously being updated and improved. National and international policies, as well as the world economy, have a direct impact on the emission scenarios on which climate projections are based. Populations move, systems adapt, globalization expands. An assessment completed last year may, by itself, have limited use in as few as three years. That same assessment, however, may be an excellent base from which to derive a new study; as such, it may find use not only today but also far into the future.